Making Candles and Ambiance Click here for our new "How to Make Candles DVD Video"
For years I loved the Yankee Candles, but found them to cost more than I could consistently afford to purchase. About the time I got into making candles myself, and finding out how truly easy and rewarding it is, SoyWax™ was just coming out as a serious competitor to Paraffin. In my opinion, there is no comparison. SoyWax™ is more economical, it burns soot free, and burns longer than paraffin based waxes. It throws fragrance just as well as paraffin based waxes. Best of all, I can simply melt the wax in my microwave, mix my fragrance oil, and pour into containers. SoyWax™ also cleans up very easy with soap and water, where paraffin does not. Beyond all of these great attributes of SoyWax™, I find the fact it supports American farmers to be the best reason. Buying paraffin, a derivative of oil, does not really support the farmers' in the United States. Because soy is so over all great, we also use it in one form or the other in our lotions and lip balms. When buying soy wax in general, make sure it is food grade if your are making balm products. In candle use, we find we can make a 26 ounce SoyWax™ candle in a pretty frosted jar for under $4! Hemp or Cotton Braided wicks are recommended with SoyWax™. To see about our SoyWax™ please click here. Yes, we did get our start from making our own easy to clean up SoyWax™ candles. Another item we just melt in the microwave and pour into beautiful frosted glass! If you are interested in making a dozen soy candles a month, or even just one, you will want to find some 26 ounce frosted apothecary jars (you can re-melt and re-use) and order SoyWax™, wicks and fragrance oil from us. We recommend only 2 ounces of SoyWax™ per 26 ounce jar, as not to saturate the wax. Another way to think of it is once ounce of fragrance oil per pound of wax. In making a great soy candle we found one well guarded secret is to place a tad of melted beeswax in the melted soy just before pouring. We consider about 5% beeswax as a "tad." This method creates a beautiful opaque look and even longer lasting candle. We learned this from the oldest candle maker in America, the Root Candle Company. Soy burns cleaner than Paraffin and just as long-if not longer. It is general half the price to make and twice as easy to clean up since it is water soluble. We hear hemp wicks allow the candle to burn longer--so we now stock hemp wicks in our supply store. 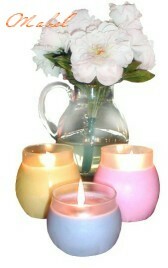 How to Make Your Own Heavily Scented Candles is another way to create a certain ambiance in a room. The ebook version of this is available in our ebook store by clicking here. Back to mans preoccupation with fire, even starting a fire in a fireplace has become ritualized. Aficionados of a true fire will tell you to use pine cones dipped in paraffin wax (shown on the right) as one way to start a fire. Pulling a primed (already waxed) wick through the pine cone with tweezers is optional. Dried rosemary bunches are also excellent and romantic ways to start a fire. Burning rosemary also tends to disinfect the entire house and leave a pleasant aroma. For more on this please read "How You Can Color Fireplace Flames." and How to Make a Fire Starter Kit.